At first glance, I definitely thought was one of those “don’t feed the zoo animals” signs. But then, whoa, an Aussie 180! Roz in Perth says the “fairly militant kitchen brigade” at her office posts notes like this all over the kitchen. 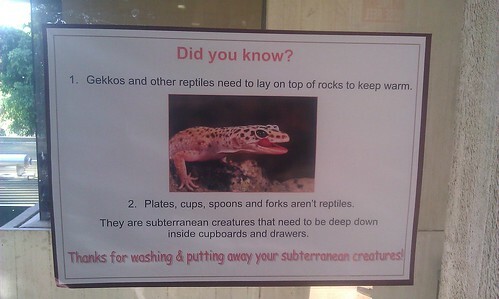 I know it can be hard to distinguish between the two at times, but dishes and cutlery are actually amphibians. They thrive perfectly well in the sink. Please, oh please, oh please, someone place a lizard in the cutlery drawer…..
No it isn’t. Especially not a leopard gecko (the one pictured). Not many amphibians are from the desert. You’re thinking of newts or salamanders. Or we can just assume that anyone with the userid “hitlerwasright” is wrong about a whole helluva lot and shouldn’t be taken seriously. Now, now, Elf… gotta look at the evidence. Based on what we’ve seen, that could easily have been just another typo. Perhaps the username was supposed to read “stiflersmomstight”. Or “antlerstonight”. Maybe “itlawsite”? I understand doing a 180 to mean doing a complete turnaround and can see what it means in the context but why an Aussie 180? I tried to Google the expression but no luck. Depends upon your global position. If you are in the southern hemisphere, an Aussie 180 is just a plain old about face. But if you are in the northern hemisphere, it must be performed while in the handstand position. Go ahead, look it up… it’s on the internet. I love those little guys! I really want one, but I think the dog would wanna eat it! Had to read that a couple of times before I got that they meant “to lie” not “to lay (eggs)”. Was confused about where knives and forks spawning came into it. Someone needs to fill the drawers and cupboards with dirt for these subterranean creatures. I don’t get it. I love my Gekkos and I have never seen my plates but on the table in the dining room.